Monica Lewinsky is, of course, the former White House intern whose “inappropriate relationship” with U.S. President Bill Clinton in the 1990s led to Clinton’s impeachment. The affair was global news and Lewinsky gained worldwide celebrity status. Fast-forward to 2014, and she’s finally joined Twitter. 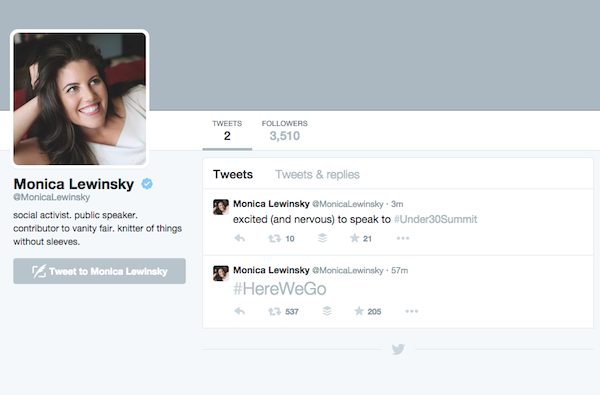 Lewinsky announced her presence on the social network with just a single hashtag: #HereWeGo. 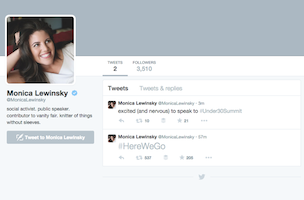 The account is verified (which means it’s official – i.e., it’s actually Lewinsky) and has already accumulated several thousand followers.